Man, did Starbucks get its social media wrong. John Moore over at Brand Autopsy started beating up on Starbucks, so we swung over to check out MyStarbucksIdea.com — a new blog designed to gather feedback from customers on how to improve the upscale coffee shops. We were a bit annoyed that Starbucks insisted upon identifying us first before we could check in — create a username, password. OK, so before any value, we have to give up something. But the real failing is the entire blog is all about Starbucks, not us as customers. 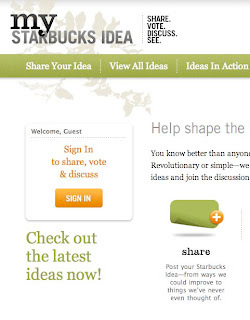 The ideas float egocentrically in, about potential points cards, free coffee on your birthday, designing more comfortable chairs, and occasionally Starbucks writes back to say they’ll consider the idea. Yeah! The problem with this is (a) it’s all about you, Starbucks, and (b) that is boring. For a company that gets blogging right, click over to Spherion, a job recruiting and placement network. The Spherion Career Blog is filled with helpful ideas about us, not them: effective job search techniques, how to manage politics at the office, the value of “soft skills” in interviewing, a pop quiz on whether you are a workaholic. The ideas are so fresh, and so relevant to our lives, that we might check back in, or even start commenting back on the stories. Think about that. Both companies will succeed in gathering feedback. But while Starbucks’ approach is cold and mechanical (give us your idea and we’ll consider it), Spherion’s is subtle (here are dozens of ideas for your career, and we bet you’ll write a note in response). It’s not the technology, layout, or even quality of writing that makes the Spherion blog work and the Starbucks site fail. It’s simply that Spherion feels helpful, and Starbucks comes off as selfish. If you want to build an online community, you have to give more than you take.